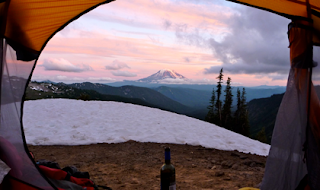 The Life and Travels of The Ellingers: Goat Rocks Backpacking - Amazing! Immediately this hike became unique when we came across a random duck on the trail (with no visible pond nearby) who had abandoned her ducklings and was flying about the trees around us. We could hear the little ducklings on the side of the trail and at one point saw one spin down the trail ahead of us at a ridiculously fast pace for flippers and being a friggin’ duck! The mosquito’s weren’t that bad but the guidebook said once we dropped down to cross over Goat Creek they would be... thankfully that wasn’t the case. As we continued up the trail we began to see more and more wildflowers and even heard a falcon in the distance. The forest was beautiful with a lot of old growth. the guidebook said it would. possibly be the perfect backpacking trip. I don’t say this just because of the views, but because of the layout of the trail as well. It was well maintained but it had a good mix of traversing alpine meadows in the sun then ducking into brief patches of trees with small streams and waterfalls running through them. This would be perfect for hot days. my Sanyo to get a 10x zoom I confirmed that they were elk and we counted about 10-12 on the two snow patches. Not until we got home 2 days later did we notice when viewing the photos we took of them on our 52” tv that there was actually a whole herd of elk, and when I say there was about 60 I’m being conservative. We didn’t see the other elk because they were lying down in the grass and shrubs between the two snow fields with only a few actually on the snow for contrast. We watched as them as we traversed the valley and saw that they were headed up the valley towards our campsite which excited us. Before reaching our destination, goat lake Emily also spotted a marmot on some rocks below our trail. sporks for our Mountain House meals which we had to squeeze out of the bags once they were made. Watching Mt. Adams light up in orange and pink alpenglow was amazing and we will definitely bring wine with us on every backpacking trip from now on. through another alpine meadow filled with beautiful alpine wildflowers and descended back into the trees below where we heard an owl off in the woods. where I put all of the goat rock photos up on the TV for everyone to check out. The Watershed softball team had just played so many of them stopped by for a little bit. I’ve climbed over 2,000 miles in the outdoors and have reached the summit of nearly 250 peaks so when I say that this was the most beautiful hike I’ve ever been it is saying a lot. Instead of trying to fit all of the 250 photos we took in this blog entry I’ve actually created a Goat Rocks Gallery for people to check out.